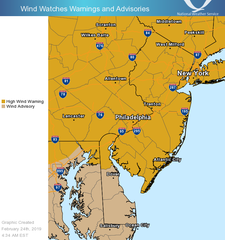 High Wind Warning issued for our area from Sunday afternoon through Monday evening. Potential for gusts of 55-60 mph. 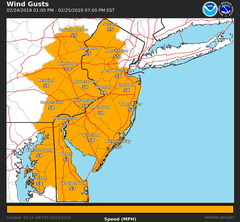 Winds of this strength may lead to scattered power outages and bring down limbs, trees, and power lines. Winds may make travel difficult. Please take precautions now for the strong winds and secure loose outdoor objects such as lawn furniture and trash cans. If you do experience a power outage, contact PSEG directly at 1-800-880-7734. You can view the PSEG outage map with tentative service restoration times at http://outagecenter.pseg.com/external/default.html .